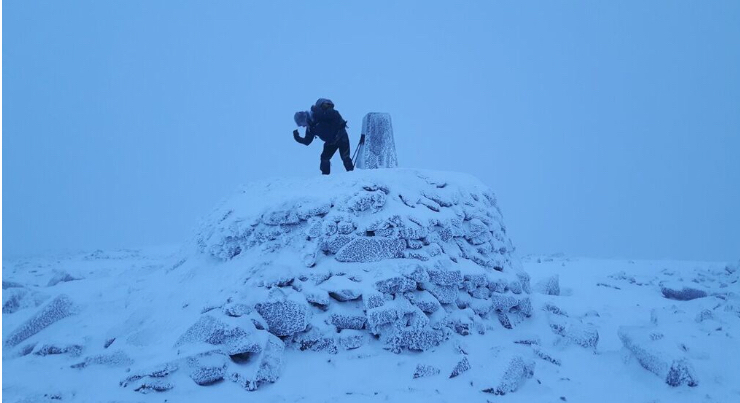 Climbing Ben Nevis on Boxing Day, or the day after, has become a family tradition. I can’t remember what first prompted my cousin Charlie and I to do it, but now it is as entrenched in the Christmas routine as the turkey and trifle. Two and a half hours later and having driven through a pearl pink dawn, we get to Fort William for a quick pee and a coffee from Morrison’s and then it is on to the carpark at the base of the mountain and the piling on of clothes. I’m wearing two base layers, a fleece, my fantastic paramo waterproof, fleecy leggings, Charlie’s waterproof biking trousers, skiing gloves, furry (not real) hat with ear flaps, bridgedale socks and scarpa 4-season boots. I also have crampons and an ice axe, walking poles, two headtorches including a LedLenser that I am testing out for www.runultra.co.uk, my iphone food and water. In addition, Charlie has extra fleeces, jacket and bivvy bag as well as more food supplies.We start off at 10.30 in bright sunshine and the hill glows with that orange-gold peculiar to Scottish winter light ahead of us. Even at the lowest point, there is black ice on the path, and I have a little mental groan to myself for the way down. 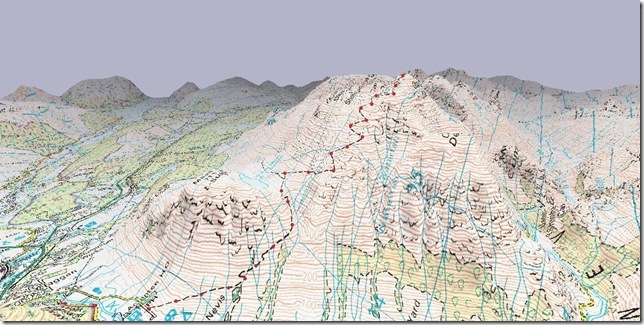 You start climbing almost immediately with a flattish stretch of easy ground underfoot to enjoy the views ahead, then a steeper section up to the lochan. Past that, the next landmark is the waterfall and on to the mind-sapping zig zags. Then there is one final push up past the cairns to the top. I am feeling great as we attack the ascent. I’ve just had a week’s walking in the mountains of Tenerife with Whereabouts Holidays and that fitness is definitely still in my legs. The sun is warm and soon some of those layers come off and I can feel the familiar sensation of sweat trickling down my face. It feels good to be burning up some of those mince pies and feeling my muscles work. 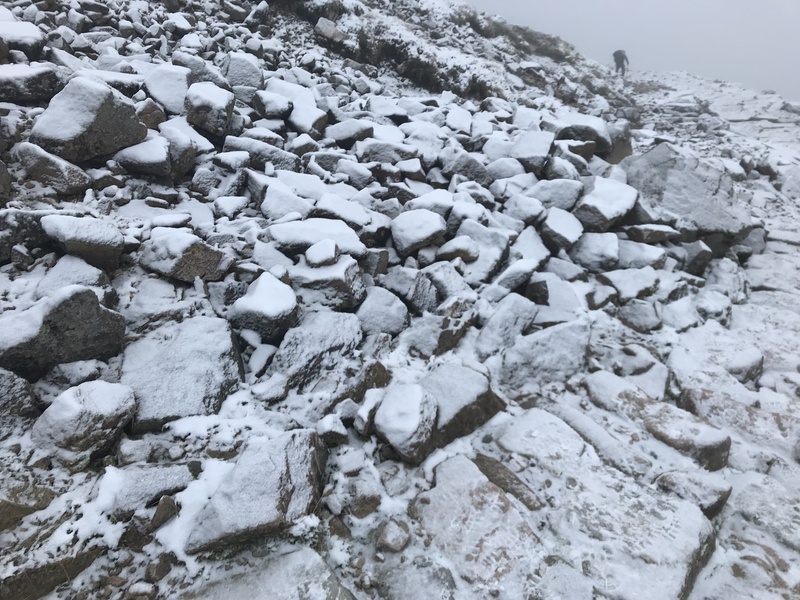 Since we were last up, the commission has done a lot of work on the path as it is in excellent condition, and there is definitely a lot more of the work to come judging by the white bags full of rocks, dropped by helicopter, lining the route. A couple of hours and a tea break takes us up past the lochan and on to the waterfall. At this stage there is no snow and Cousin Charlie and I reminisce about the last time we were up when there was so much of it that we could cross straight over. The sun is still out and we get the views back to Fort William and across the sea lochs. There’s a glorious feeling of space and wildness. Then we turn onto the zig zags and soon the snow starts. Cousin Charlie had a real goal to achieve in climbing the Ben this year. In April, after years of abuse through running (sub 1.30 half) and enduro motorcycle racing, he had to have a hip replaced. 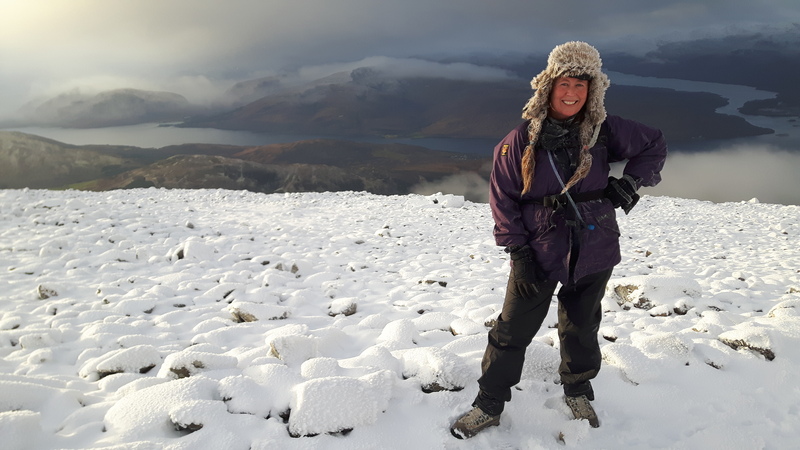 He’s been recovering since then, and his aim was to get to the summit and take a picture to send to the Golden Jubilee Hospital in Glasgow, where he had the operation. He suffered on the up and I could see the effort written into his face, but there was never one word of complaint. Every time I asked, “How’re you doing?” I got a “Yep, fine, no bother.” This was his first big endurance outing since the op, and what a way to start back into it! But years of core strength and fitness stood him in good stead. We climbed up slowly but steadily and fought gently about the number of tea breaks. I wanted to push as I could see the sun sinking but Charlie pointed out that a short break would help us in the long run, and, after all, who can resist a hot cup of tea and a pork pie? There were a few people out, not many, but they included some super-fit runners, who loped past us and then passed us again on their way down as we were still heading up. Strong hearts and lungs to get them up but, even more impressive to me, was the sure footedness and balance to get them down without injury. Zig zags over, and we were on the last drag past the cairns to the top. Nearly there, nearly there, and then suddenly it is flat and the little hillock with the summit marker looms out of the snowy whiteness. What a feeling. There is no better moment than when you reach a goal that you have had to fight for. I get to the top and raise my sticks over my head. I am on top of our country, our highest point, at one with this wild weather and wild place. I can feel myself absolutely present in this moment, standing still on a spinning planet. Then, Charlie, comes up and how he must be feeling. Just a few months on from major surgery and here he is, at the top of Ben Nevis in the middle of winter. What an achievement! The sun is setting fast, though, and after Mum’s turkey sandwiches in the hut, we get on the crampons and set off back down. I hate descending the Ben in the dark, even though it happens every year, and spend a lot of my time working out how NEXT year we are going to stay over at a B&B and set off before dawn. Going up in pitch black is a lot safer than coming down in pitch black. However, I do have my new Ledlenser headtorch on and it is excellent. A really bright beam that angles just nicely in front of me and stays bright all the way down. Magic is in the air that night, though, to ease the way. We see a perfect half moon rise through the snow-filled gloaming over the peak of the Ben. At the waterfall, we stop for a last cup of tea and sitting there in the moonlight, with our torches off, I feel a moment of sea-deep contentment as I listen to the water cascading down below us and look up at the stars. We set off again. “Look,” says Charlie quietly. “Over there, can you see the eyes? It’s deer.” There they are, four pairs of glinting eyes looking at us as we look at them, sharing the mountain. The path winds on. Charlie who is really nippy on the downhill, waits for me patiently as I granny my way down the mountain. The snow is like fairy lights in my torch beam and then, not nearly soon enough, we see the car park. That black ice I spotted on the way up, almost gets me, but I save myself and then it’s over. Ben Nevis climbed and descended safely. High fives all round and another year written into our little family legend.